The R-PLEX Human E-Selectin Antibody Set includes a matched capture and detection antibody pair and calibrator for the quick and easy measurement of E-Selectin in biological samples. R-PLEX products leverage MSD’s electrochemiluminescence technology for better sensitivity and a larger dynamic range than traditional ELISAs. R-PLEX matched antibody sets enable the development of singleplex and multiplex immunoassays. Individual assays may be developed using MSD avidin- or streptavidin-coated plates. Custom multiplex assays with any combination of R-PLEX analytes, as well as R-PLEX plus U-PLEX analytes can be developed on U-PLEX MULTI-SPOT plates. To learn more about the advantages of R-PLEX products click here. 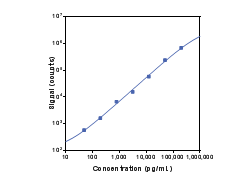 Calibration curve for the R-PLEX Human E-Selectin Antibody Set was assessed and representative data is presented below. Description - E-selectin (endothelial leukocyte adhesion molecule-1 (ELAM-1), CD62E, ESEL, LECAM2) is a cell–specific adhesion molecule expressed on vascular endothelial cells in response to cytokines such as IL-1β and TNF-α. Selectins are involved in interactions between blood cells and the endothelium and in cancer metastasis. Systemic inflammation associated with severe intestinal injury in extremely low gestational age newborns. Systemic inflammation, intraventricular hemorrhage, and white matter injury. Blood protein concentrations in the first two postnatal weeks that predict bronchopulmonary dysplasia among infants born before the 28th week of gestation. Blood protein concentrations in the first two postnatal weeks associated with early postnatal blood gas derangements among infants born before the 28th week of gestation. The ELGAN Study.